This artist's illustration depicts an imagined view from the surface of one of the three newfound TRAPPIST-1 alien planets. The planets have sizes and temperatures similar to those of Venus and Earth, making them the best targets yet for life beyond our solar system, scientists say. TRAPPIST-1 is 2,000 times less bright than the sun, a bit less than half as warm as the sun, about one-twelfth the sun's mass, and less than one-eighth the sun's width, making it only slightly larger in diameter than Jupiter. TRAPPIST-1 is a type of star known as an ultracool dwarf that is very common in the Milky Way, making up about 15 percent of the stars near the sun. Scientists spotted the three planets by observing TRAPPIST-1 dimming at regular intervals as the worlds crossed in front of it. This is the first time that distant planets, called exoplanets, have been found around an ultracool dwarf, the researchers said. 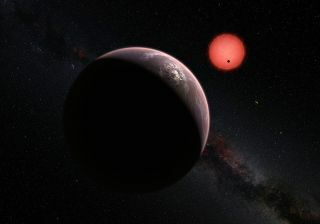 "So far, the existence of such 'red worlds' orbiting ultracool dwarf stars was purely theoretical, but now we have not just one lonely planet around such a faint red star, but a complete system of three planets," study co-author Emmanuël Jehin, an astronomer at the University of Liège, said in a statement. These three planets are each only about 10 percent larger in diameter than Earth. "The kind of planets we've found are very exciting from the perspective of searching for life in the universe beyond Earth," study co-author Adam Burgasser at the University of California, San Diego, said in a statement. The two innermost planets are about 60 to 90 times closer to their star than the Earth to the sun, with orbits only 1.5 and 2.4 days long, respectively. The orbit of the third planet is currently less certain, ranging between 4.5 and 73 days long. The small size of the star and its planets' orbits means "the structure of this planetary system is much more similar in scale to the system of Jupiter's moons than to that of the solar system," Gillon said in the statement. Although all three planets orbit very near their star, the inner two planets receive only four times and two times, respectively, the amount of radiation that Earth receives, since their star is much fainter than the sun. The third outer planet probably receives less radiation than Earth does, the researchers said. Given how close TRAPPIST-1's trio of planets are to its star, the researchers suggest TRAPPIST-1's gravitational pull likely forced these worlds to become "tidally locked" to it. When a planet is tidally locked to its star, it will always show the same side to its star, just as the moon always shows the same face to Earth. This causes those worlds to each have one permanent dayside and one permanent nightside. The third of TRAPPIST-1's planets, the one farthest from the star, may lie within the star's habitable zone — the area around a star where planets have surfaces warm enough to have liquid water, a key ingredient to life as it is known on Earth. The two planets closest to TRAPPIST-1 may have daysides that are too hot and nightsides that are too cold to host any kind of life as it is known on Earth, but the researchers suggest that the borders of the planets' day- and nightsides may be sweet spots temperate enough for life. "The detection of these planets [around TRAPPIST-1] should intensify the search for more systems around ultracool dwarfs," Gillon said. "Exciting scientific adventures are now beginning." This image shows a size comparison between Earth's sun (left) and the tiny, ultracool dwarf star TRAPPIST-1 located 40 light-years from Earth. The star is home to three alien planets that may have the potential to support life. Since the planets around TRAPPIST-1 are relatively nearby, scientists can in principle analyze the compositions of their atmospheres, "and further down the road, which is within our generation, assess if they are actually inhabited," study co-author Julien de Wit, a planetary scientist at Massachusetts Institute of Technology, said in a statement. "All of these things are achievable, and within reach now. This is a jackpot for the field." The masses of these worlds remain unknown, but future research can pinpoint how much each of these planets gravitationally pulls at its siblings when they get close to each other, Gillon said. The strength of each planet's gravitational pull will help scientists deduce its mass, which in turn will help them estimate the planets' densities and, thus, compositions, he added. "We can tell if the planets are probably rocky, or rich in ice like the moons of Jupiter, or rich in metal like Mercury," Gillon said. The researchers noted that the Hubble Space Telescope and the forthcoming James Webb Space Telescope could help analyze the atmospheres of those planets for molecules linked with life, such as water, carbon dioxide and ozone. "Now we have to investigate if they're habitable," de Wit said in the statement.